Notre Dame Irish ready to fight! The Fighting Irish of Notre Dame return home to South Bend, Indiana, this week to take on the Air Force Falcons. The faithful that will fill Notre Dame Stadium on Saturday, will be treated to more than just a game. A sculpture of legendary Irish coach Dan Devine will be unveiled at Gate A, Dan Devine Gate, outside Notre Dame Stadium. In Devine’s six seasons at Notre Dame, he compiled a 53-16-1 (.764) record including the 1977 national championship. He was inducted into the College Football Hall Of Fame in 1985, and passed away, aged 77,in May of 2002. Devine’s sculpture joins the five former Irish football coaches who have won one or more national titles at Notre Dame, Knute Rockne (1918-30), Frank Leahy (1941-43,1946-53), Ara Parseghian (1964-74), and Lou Holtz (1986-96). The Falcons were extremely fortunate not to have lost last week vs Army(35-34 OT), in the race for the Commander-In-Chief Trophy.The Irish are coming off a seasons best display against Purdue (38-10), in which the offense and defense steam-rolled their opponents. The Air Force Falcons have already lost their top two defensive linemen in end Zach Payne and nose guard Ryan Gardner. Senior linebacker Patrick Hennessey is expected to miss the Notre Dame game after breaking a bone in his hand. The Falcons defensive secondary has also taken a hit by way of cornerback Chris Miller(leg injury) and safety Brian Lindsay(groin injury). There seems to be no such injury issues with Notre Dames offense as the starting 11 from last weeks massacre return healthy this week. Expect the Irish offensive line to bully an undersized defense all over the field. Expect to see more of the same from the passing duo of Rees to Floyd. On paper this should be a very routine victory for the Irish offense, it is of little wonder then, why Notre Dame are favored in the contest by 17 points. 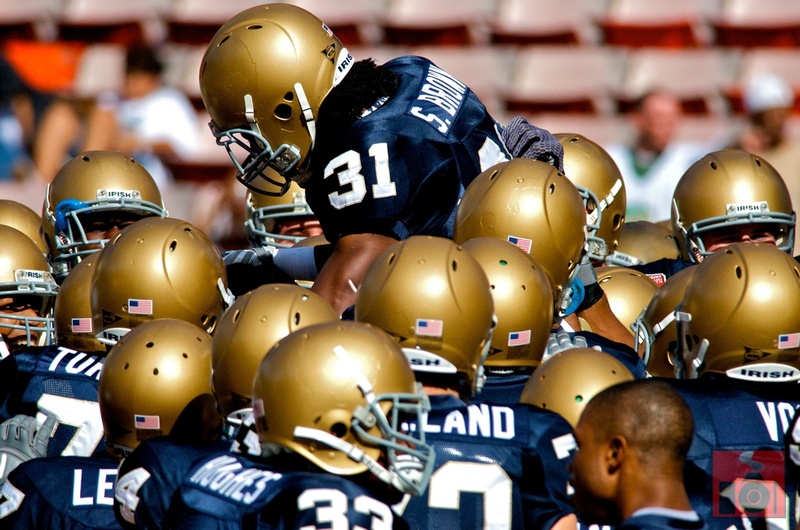 In the past number of years the service academy's have given the Irish defense fits, with their triple-option attack. Air Force are currently ranked No. 3 nationally with 365 rushing yards per game. Quarterback Tim Jefferson's passing efficiency rating of 184.92 will also keep the Irish secondary on it’s toes. Defensive End Ethan Johnson is currently listed as questionable to play this weekend, which should see Freshman DE Aaron Lynch start. Lynch has had a stellar year at the defensive end position, but he will have more than his hands full against a very tricky option attack. I expect Coach Kelly will sit Johnson in an effort to give him time to heal going into the bye week in preparation for the USC game. It will be very interesting to see how the young Irish defensive line will hold up against the misdirection triple-option Falcon attack. This is a huge key to the game. Once again the punt return game was diabolical for the Irish last week and continues to rank as one of the nations worse. Air Force punter David Baska is averaging over 47 yards per kick and field goal kicker Pat Herrington is 3-4 on field goals so far this season. Irish kicker David Ruffer is not showing the consistency that earned him a scholarship last season. Irish punter Ben Turk is showing some semblance of improvement by kicking rugby style of late, and has managed to push his average over 40 yards.